Convert your PDFs to Excel files on Mac! One simple click is enough to convert your PDF files into editable Microsoft Excel documents! 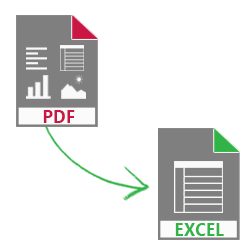 Convert a PDF document to Excel with little to no loss in your original formatting. eXpert PDF for Mac will analyze your PDF file, extract the data, and convert PDFs to an editable Excel file. This easy one-click conversion allows you to modify the data without wasting time re-entering the information! Save even more time with batch conversion! The batch conversion feature allows you to convert multiple PDFs to the desired format at the same time. Also, you can easily merge several Excel documents into a single PDF file.